How careers end... Lawyers are disbarred. Ministers are defrocked. Electricians are delighted. Far Eastern diplomats are disoriented. Drunks are distilled. Alpine climbers are dismounted. Piano tuners are unstrung. Orchestra leaders are disbanded. Artists' models are deposed. Cooks are deranged. Dressmakers are unbiased. Nudists are redressed. Office clerks are defiled. Mediums are dispirited. Programmers are decoded. Accountants are discredited. Holy people are disgraced. Pastry chefs are deserted. Perfume makers are dissented. Butterfly collectors are debugged. Students are degraded. Electricians are refused. Bodybuilders are rebuffed. Underwear models are debriefed Painters are discolored. Spinsters are dismissed. Judges are disappointed. Vegas dealers are discarded. Mathematicians are discounted. Tree surgeons disembark. Hourly employment prospects in the Pittsburgh area over the next 3 years have improved dramatically over what we have experienced since 9-11. The list of all the recent announcements that will influence this is long: Westinghouse will move 3,000 employees from Monroeville to Cranberry Twp, then ADD another 1,000 employees, Simon Malls is nearing final approvals on a new Waterfront style mall in Cranberry that will employ over 1,000 people. Another local developer, Don Rogers, who has many successful retail projects already under his belt, has plans for an additional 800,000 square foot office complex around the new Simon Mall property projected to bring yet another 1,000 jobs, the new casino in Pittsburgh will create a projected 1,000 permanent jobs while the casino near the Meadowlands in Washington County will add another 300-400, The new pens arena will not only add many additional construction jobs over the next 2 years but will net out additional hourly positions once completed. On smaller scales but still significant Bayer will hold a grand opening today on a new call center that will add 60 jobs, a German company, Sycor, will add 80 jobs with the move of it’s headquarters to Pittsburgh, Medrad has recently projected the addition of another 100 jobs. The Post Gazette’s Bill Toland wrote a nice article on the impact all the new construction will have on the area over the next 2-3 years. Yes, there have been a couple of set back, most notably Sony eliminated up to 900 positions over the next year, but these will be more than made up with jobs added elsewhere in the metro. Hopefully some of the lost Sony jobs can be made up by new tenants in the space being freed up by Sony, but only time will tell. Manpower released a survey this past week on the hardest to fill jobs nationally. It is noted that the positions have decidedly trended toward blue collar. Click this link to read more. Well Attended Pittsburgh Diversity Career Expo A Big Success! The March edition of the 2007 Pittsburgh Diversity Employment Expo came to a close yesterday with over 800 jobseekers taking advantage of the opportunity to speak with employers face to face. We had about 300 of the attendees fill out anonymous surveys as to their race, age and occupation, and what types of employment they were seeking. We’ll share this information when it is compiled. We had most companies expressing how pleased they were overall by the qualifications of candidates. 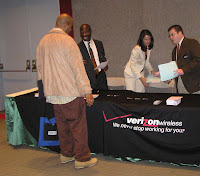 We saw Verizon Wireless and some other companies in attendance doing some interviews on the spot and dozens of job seekers have been scheduled for follow up interviews or online application processes. If you are a jobseeker and missed this opportunity please see the list of companies in attendance posted last Friday and seek them out. Many of them also have opportunities advertised in the weekly Employment Guide and/or online at http://pittsburgh.employmentguide.com. We will hold two more large Diversity events in July and early October so keep watching for details. This week’s hottest employer is Masonic Village in Sewickley. With openings in many different departments including nursing, food prep, marketing, maintenance, environmental services and more. They are located minutes from I-79. Masonic Village is a 50-acre campus located 12 miles from the city of Pittsburgh. The types of residential living accommodations available include four-story apartment buildings and single level villa homes. The population includes: Residential Living: 228 apartments, 35 villa homes, Assisted Living: 64, and Nursing Care: 128, for a total of 455. Pick up this week’s Employment Guide or go to http://pittsburgh.employmentguide.com to more information on background requirements and how to apply. It looks like a great mix of companies will be on hand at the big job fair to be held at the U.S. Steel Building this coming Wednesday, March 28th from 10:30AM to 3:00PM. If you are a job seeker looking for hourly entry level up to mid-level skilled positions, you don’t want to miss this event. It is free for jobseekers and requires no pre-registration. We ask that you bring plenty of resumes and dress for success. The Urban League of Greater Pittsburgh will be on hand to talk about their services in resume writing, interviewing skills and much more. Make it a point to seek them out! Commute info will be there with information on how city residents can find transportation to jobs. Approximately 30 companies will be on hand looking for positions in Customer Service, Sales, Retail, Office/Clerical, Protective Services, Construction, Factory/Warehouse, Healthcare and allied Healthcare, Social Services, Drivers and more. The current list of companies includes Verizon Wireless, Leed’s, Best Buy, Highmark Blue Cross Blue Shield, Mylan Laboratories, Sunrise Senior Living, Lenzner Coach Lines, Frito Lay, Avis/Budget, Southwest Airlines, Transitional Services, Community College of Allegheny County, City of Pittsburgh, Manufacturing 2000, Advance Auto Parts, The Home Depot, Mainstay Life Services, WQED-TV, The Ready Set Companies, OK Grocery, Goodwill, Echostar, PA State Police, Maronda Homes, PA CareerLink, Cintas, All-State Career School and more. The concourse level in the U.S. Steel building is the lower level as you walk into the main lobby. Just go down the escalator and follow the signs. The address of the Steel Building is 600 Grant St., Pittsburgh, PA 15222. If you take the “T” subway system you can get off at the Steel Plaza and walk right in! Information will also be in the Employment Guide. Hopefully we’ll see you there! The decision announced this week by Westinghouse to move their entire Monroeville work force to Cranberry Twp. (25 miles down the PA Turnpike) has created more buzz than the Pittsburgh area has seen in many years – both good and bad. It is important to remember, very little will change for about 2 years. Overall the effect on the region’s job market will be neutral for a year or two after the move occures early in 2009. Moving 3,000 plus employees from Monroeville to Cranberry Township will not by itself add or lose jobs for our region. The impact on the individual communities, however, will be tremendous. If there is any silver lining in this for Monroeville it is only that they have 2 years and not 2 months to find replacement tenants for the Westinghouse campus. The impact on the hourly jobs arena will be multiplied by a factor of 3. This is how many support jobs could be affected by this move unless mitigated by replacement jobs for Monroeville. One hotel alone is reporting they will lose over 10,000 room nights per year by this loss. Restaurants and retail in the Monroeville area stand to be impacted severely unless government officials can somehow find a solution. Now for the positive side to this story. Cranberry will not only GAIN over 3,000 high paying jobs (average salary of the positions is $70,000 per year), but now multiply this number by 3 for how many hourly support jobs that will be created. Any employer of hourly people in Cranberry Twp. will tell you it is already almost impossible to find qualified hourly workers in their area. Where will these workers come from? The only possible answer is over a broad region. Butler County, Beaver County, Lawrence County and northern Allegheny County will all benefit greatly. With the prediction that another 1,000 to 2,000 jobs will be created by Westinghouse after the move, the demand increases even more for hourly support. The trickle down will extend to banking, real estate, automotive, healthcare, Office/Clerical and skilled trades. The Marriott North, located adjacent to Cranberry Woods, now look like geniuses. The Pittsburgh region has not seen anything like this in recent memory. It will be like our own local gold rush to the northern tier of our region. Ten’s of thousands of lives will be strongly affected. Far more people will benefit than lose out. Chalk this up to yet another major victory for the Pittsburgh metro. But let’s not forget the work that needs to be done for the Monroeville area! Giant Eagle Express is this week’s Hottest Employer. The first of these new concept stores is expected to open soon in Harmerville just off Route 28. This is reported to be a 13,000 sq ft. location that combines a small sized Giant Eagle grocery store with gas pumps and a drive through pharmacy. Larger than a GetGo, but smaller than a regular Giant Eagle, shoppers will be able to get in and out faster. The positions being offered are extensive and will be detailed in future ads within the weekly Employment Guide. Suffice it to say they will need to cover everything from baggers and clerks to department managers and assistants. With the successful rollout of this concept more Giant Eagle Express stores could open in other select areas around Pittsburgh. Evidence Continues To Build For Pittsburgh Job Market Expansion! As reported in the Post Gazette, the quarterly Manpower Employment Survey is forecasting robust hiring for the Pittsburgh metro over the next 3 to 6 months, to quote “Pittsburgh-area employers are expected to hire at a steady pace in the second quarter, according to a Manpower employment survey. Twenty-nine percent of area companies polled expect to do hiring in the April-June period, while 9 percent expect to reduce their payrolls”. The downside, of course, is the announcement made by Sony to lay off 900 workers due to production shifts. Hopefully the people affected by the layoffs will now find it easier to regain employment due to the healthy state of the local job market. We predicted a week ago that a healthy jobs environment was under way due to the climate of our business here at The Employment Guide. We are strictly recruitment advertising and are seeing increased demand in many job categories, most notably hospitality, healthcare, manufacturing and customer service. Another reason for optimism is our area immunity to large reductions in the construction arena. Construction is losing large numbers of jobs in other metros around the country due to the real estate bubble that has burst, but Pittsburgh, never a part of the boom of the past four to five years, has remained stable in this area. We have intentionally avoided the topic of our Pittsburgh Penguins search for a new home because, frankly, no jobs angle could be developed until the details of a deal became public. Now that it has, the discussion can begin on just what this will mean for southwest Pennsylvania from a quality of life standpoint (of which employment has a majority stake). Locking the Pens up for 30 years will not only maintain hundreds of direct and thousands of indirectly dependent jobs in the area, its value to our collective psyche is beyond quantification. Most of us know we live in a metro area that has bled a large percentage of our youth to other cities due to the lack of opportunity both real and perceived. Losing the Pens, who’s core audience is the youngest of all professional sports, would have contributed to the perception that our ‘Burgh continues to die a slow death. Having reached the deal to keep them is the single biggest impact, each of the 3 government officials involved, will have on our lives during their careers. Governor Ed Rendell, County Chief Executive Dan Onorato and Mayor Luke Ravenstahl each deserve high praise on a job well done. The point to all this is the impact for this deal will not only keep and grow hourly jobs in Pittsburgh directly, it will greatly enhance the ability of corporations to recruit professional candidates from outside our area as well as retain those already here, which will indirectly increase the needed hourly support jobs (restaurant, hospitality, healthcare, retail and banking just to name few). The prospect of future hourly employment in the Pittsburgh region, already good, just became better! Pittsburgh Area Jobs Up More Than 11,000 From a Year Ago! It seems our post from Friday is already beginning to look prescient! The Post Gazette this morning reported the Pittsburgh area unemployment rate in January dropped 1/10th of a point to 4.6%, one tenth below the state rate. The big news here was the seperate business payrolls survey which showed more than 11,000 new jobs have been created in the Pittsburgh Metro area (7 county) since January 2006, the largest increase since 2001. If you are a job seeker in the Pittsburgh area it is finally starting to become a seller's market after 6 long years of stagnation. For recruiters in our area this means it is becoming more difficult to fill positions. Turnover, especially in lower paying positions, could increase dramatically over the next year. We found information from citytowninfo.com that does a super job in summarizing the current Pittsburgh job market. We believe these numbers are from 2005, the most recent totals available. If you’ve ever wondered what a certain career path will mean financially, this is a great place to look. The top half shows local job numbers and median incomes for jobs typically requiring a college degree. The second half of the page shows the same, but for jobs that typically do NOT require a college degree. In determining who would be this weeks employer of the Week (most number of needs or severity of needs) we turned to the healthcare arena. With healthcare being the largest section in this week’s Employment Guide we felt it was not so much a single company with tremendous needs in the Pittsburgh area but the industry in general! Most of the positions revolve around nursing. It’s well known that the Pittsburgh metro has one of the oldest populations in the country so it makes sense that we also have one of the highest concentrations of nursing homes per capita. This has created a tremendous need for nurses. Allied healthcare positions in high demand include certified nurse assistants, home health aides, dietary aides and activity assistants. Some of the facilities are offering free training programs for non-nursing positions. Pick up this weeks issue of the Employment Guide to find out more. The national Jobs Report came out this morning showing, nationwide, a net gain of 97,000 jobs, coming in almost right on projections. The unemployment rate dropped to 4.5%, beating expectations. This is alleviating a lot of fear that it could have been much worse. Here in the Pittsburgh area, very unofficially, we are seeing one of the biggest booms unfolding in the hourly employment arena in over 5 years. We say unofficially because we do not do our own local surveys, but based on our business climate we predict some pretty healthy LOCAL numbers will be reported in a month or two to come. We are seeing healthy business increases in some temporary personnel companies that also support optimism. Stay Tuned! It has already been predicted locally by officials that this could be a relative break-out year for the Pittsburgh area job market due to final absorption last year of the US Air job cuts. Pittsburgh Human Resource Association Newsletter is a Winner! We just received the March newsletter from the Pittsburgh Human resource Association and the new format they have developed is a fantastic improvement! This issue has information on the People Do Matter awards coming up on April 11th. If you are in human resources and haven’t at least looked into joining this organization you owe it to yourself to do so. They have a very active chapter in the Pittsburgh region with career enhancing seminars and courses. They’re networking activities are very strong as well. We’ve put up a link to their website so go check out the possibilities. Work is what you make it! We saw this on another blog posting, thought it was good! A guy from Cleveland dies and goes to Hell. He had been a horrible man all his life. The devil puts him to work breaking up rocks with a sledgehammer. To make it even worse, he cranks up the temperature and humidity. After a couple of days, the devil checks in on his victim to see if he is suffering adequately. The devil is aghast as the Clevelander is happily swinging his hammer and whistling a happy tune. The devil walks up to him and says, "I don't understand this! I've turned the heat way up, it's humid and you're crushing rocks. Why are you so happy?" The Clevelander, with a big smile, looks at the devil and replies, "This is great! It reminds me of August in Cleveland. Hot, humid and a good place to work. It reminds me of home. This is fantastic!" The devil, extremely perplexed, walks away to ponder the Ohioan's remarks.He then decides to drop the temperature, send down a driving rain and torrential winds. Soon, Hell is a wet, muddy mess. Walking in mud up to his knees with dust blowing in his eyes, the Ohioan is happily slogging through the mud pushing a wheelbarrow full of crushed rocks. Again, the devil asks how he can be so happy in such awful conditions. The Clevelander, with a big smile, looks at the devil and replies, "This is great! It's just like April in Cleveland. It reminds me of working out in the yard with spring planting. It reminds me of home. This is fantastic! "Now the devil is completely baffled. He is more determined than ever to make the Ohioan suffer. He then makes the temperature plummet. Suddenly, Hell is blanketed in several feet of snow and ice. Confident that this will finally make the Clevelander unhappy, the devil checks in on him again. He is again aghast at what he sees!The Ohioan is dancing, singing, and twirling his sledgehammer as he cavorts in utter glee. "How can you be so happy? Don't you know it's 40 below zero?" screams the devil. Jumping up and down the Clevelander throws a snowball at the devil and yells "Hell is frozen over!! This means the Browns won the Super Bowl! !The Browns won the Super Bowl!!" We have been holding job fairs in the Pittsburgh area now for over 6 years and we’re still amazed at how many employers show up completely unprepared to take advantage of this opportunity for face time with potential candidates. Just as jobseekers can greatly effect the success they get from a job fair by following the tips listed below, so too can recruiters. Consistently, the companies and recruiters who tell us after an event they did not receive value from a job fair are the ones who sat stone faced behind their table while job seekers streamed by. Don’t be afraid to stand in FRONT of your table. Smile and shake hands. Make eye contact. Remember, you are representing your company to job seekers. The most qualified candidates are going to be choosier about whom they speak with. Be active around your table and engage them! With that said, job seekers tend to go to job fairs to speak with specific companies they see ahead of time will be there. If you plan on attending a job fair, let potential candidates know ahead of time you will be there. Do not rely solely on the group ad run for a job fair to do this. A job fair is most effective if done as part of a process. Not as a single event. Do your own marketing ahead of time to let job seekers know you will be there. Otherwise, you will end up only speaking to candidates who came to the job fair to speak to someone else! Finally, have a plan in place to set up interviews after the job fair is over. Do not just rely on handing out collateral and hope good candidates will call you later. Show them they are important to you and the better ones will respond. As a recruiter, following these tips will greatly enhance your job fair experience. We speak today about ROI, return on investment. Our experience has shown that the companies that do not like to do job fairs based on poor past experiences are they ones who failed the most to properly engage job seekers and follow these tips. Doing so will ultimately makes your jobs easier by increasing your likelihood of finding more qualified candidates resulting in less turnover down the road! If you are planning on attending our big job fair coming up on March 28th, or any job fair around Pittsburgh, there are simple steps you can take to benefit the most from the time you’ve invested. Some of these may seem like common sense but you may be amazed how many attendees don’t follow these simple tips. Our biggest single complaint we hear from company representative’s concern proper attire. Though a nice suit and tie will always make the best first impression, even clean and neat “business casual” will work wonders over what some people seem to think is appropriate. NEVER wear jeans or tee-shirts. Even for entry level hourly positions like restaurant/hospitality or housekeeping, employers will judge you by the clothes you wear. Making the effort to look nice will go a long way in getting a second interview and a chance for success. Next would be to have a nice resume put together. Even if you have never used one before and don’t know where to start to create one, there are resources available, some free some for a fee, that will either show you how or actually create one for you. Two organizations that come to mind that can help in this area are PA Careerlink (the state employment offices) and the Urban League of Greater Pittsburgh. Contact them and the results will be fast! Third, don’t be afraid to press some flesh and smile at the job fair. Even recruiters are human and always respond well to professionally friendly people like you. Shake hands and show your pearly whites! This will help you stand out from the many other jobseekers they have seen that day. Make eye contact and speak with confidence. Show them they can believe in you because you do! Finally, don’t be afraid to use a job fair as a “practice interview”. Use this time to hone your skills at speaking about yourself. Even more important, use this time to practice asking questions and showing interest in the people and companies you meet with. This will improve your confidence when the time comes for a one-on-one interview with any potential employer. Following these easy tips will greatly improve your chances of landing a job that excites you. They are effective at breaking the barrier between you and your perfect job. If you are in the midst of a job search we invite down to our job fair at the US Steel building on March 28th from 10:30 AM to 3:00PM. There will be 25-30 companies looking for many different types of positions. It’s free to attend and who knows, it just may change your life for the better. It’s all about opportunity! Hottest Job of the Week – Machinist! This week it’s not so much who is the hottest employer as it is the hottest career choice. Recently the number of machinist and factory positions advertised for has taken off to levels not seen since 2001. In this weeks Employment Guide there are factory and machinist jobs at Chelsea Building Products in Oakmont, Royston Laboratories Division in Blawnox, Melampy Manufacturing, Randstad and Steel Built Corp. This is in line with predictions over the past few years that the supply of workers training for these positions, especially Machinists, was not going to adequate in the Pittsburgh area to meet demand. Fortunately for our area, there is an initiative that has been around for a few years now called New Century Careers, helping job seekers acquire training in the skills necessary to be a machinist. Machinist jobs are not the same as they were 30 years ago. These now involve computer skills and usually business casual work attire. Not the “dirty – greasy” job it used to be long ago! If you want more information from New Century Careers, Manufacturing 2000 on their training programs their local Pittsburgh number is 800-822-9337. Their programs are free and take less than 6 months. Hottest Employer For The Week Of February 26th! Now Accepting Your Ideas. Why? You’re the best at what you do, and that’s something Verizon Wireless can relate to. We’re the market leader in wireless communications, keeping our customers happy by hiring the very best people to serve them. You belong on our team. We’re looking for an enthusiastic individual who can respond to a high volume of inbound customer calls; research and resolve billing and service equipment issues; provide information on our products and services; and demonstrate our commitment to customer service by following up on calls and ensuring superior results. You also have to quickly analyze customer concerns and needs while balancing company revenue concerns.Qualifications: This position calls for a team player who can also work independently with minimal supervision. Along with computer proficiency in Word and Excel and strong keyboard skills, you must have significant customer service and on-line customer contact experience, the ability to analyze and resolve problems and excellent communication skills. An associate’s or bachelor’s degree is preferred. Bilingual candidates (Spanish/English) are highly desirable. The value begins with you. Own Your Career. We are an equal opportunity employer m/f/d/v.